We are inviting people of all nations to join our crew. The legendary bark "Kruzenshtern" is open for the whole world! It`s the territory of friendship and cooperation. We are happy to introduce our new educational program in English. All activities onboard are voluntary, but noone ever refused to climb aloft the mast, stand the watch or trim the sail. People come to us to open the door to the amazing world of sails and tallships! "The sea is a great freedom, great horizons and great challenge. It's a long way to go.The best people come to our tallships, they want to grow, get new knowledge, feel the romance of the sea and the sail. We introduce people to a real seamen life onboard. The crew members of legendary barks Sedov and Kruzenshtern are always here to assist us". 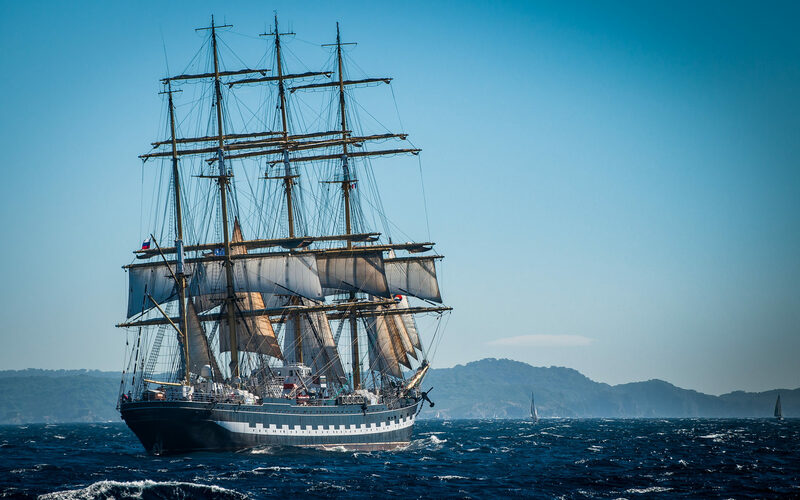 Kruzenshtern is one of the biggest and oldest sailing training ship in the world, the last of the P-Liners and one of the two last windjammers. Kruzenshtern is the most valuable historical sailing vessel with millions of fans all around the world. Our mission is to introduce our trainees to the world of Sailing. According to the rules of the sale training ship, the educational program participants are the members of Kruzenshtern crew. They may perform practical tasks with the crew: stand the wheel, climb aloft the masts, trim the sails, produce meteo forecasts, set the course, calculate the tides, use the navigation tools etc. Participation in all the activities onboard is voluntary. You will gain new skills which you had no chance to learn living in big cities. These are rescue operations in case of fire or evacuation and first aid procedures. You will get a chance to climb up the masts that left no one indifferent! Trainees will live onboard in air-conditioned cabins, 10 -12 persons per cabin. There are male and female cabins. Hot showers are located next door. There is also a special "trainees salon"where you can get a cup of tea, watch TV, discuss educational programs or just hang out with your travel buddies. All trainees should be fit and in good overall health. This is really important. If you have any doubts or any medical condition(s) please contact us. There is 24 hrs medical service onboard. We provide maritime medical insurance for every trainee . Trainees should be at least 15 y.o. If you are 70 years old or over we kindly ask you to provide the health statement signed by your physician. The KRUZENSHTERN is a very solidly built ship. Experienced crew members will ensure the ship's safe operation. The bark has all nesessary safety equipment. As a training ship The KRUZENSHTERN holds government license for education. Comandor of educational centre "Maritime Practice"
Yacht captain. Alumnus of Novosibirsk yacht clubs «Nauka» and «Chkalovets». Crew member of Freedom yacht team. Prizewinner of Russian and international competitions. Сaptain 1st rank. In the past — nuclear submarine captain. Sailing qualification — yacht captain RFSS, IYT instructor. Sailed more than 60000 nautical miles, including 6000 nm at Clipper Round the World sailing race (2011–2012). ближайший к Куксхафену аэропорт находится в Гамбурге, Германия (120 км). Трансфер до порта Куксхафен из аэропорта Гамбурга будет осуществляться в 13: 30. В случае, если вы решили прибыть в порт Куксхафен самостоятельно, вы должны прибыть не позднее 15.30. Посадка на якорь. От порта до корабля появится моторная лодка. Высадка на якорной стоянке запланирована в Гданьске 3 июля. Расчетное время прибытия на землю -14.00. Расстояние от порта до аэропорта Гданьска составляет 16 км. Будет трансфер в аэропорт. Scheduled trip plan is a subject to change due to weather conditions. 13.00 - 13.30 Trainees meet at the airport of Hamburg. 13.30 - 15.30 Bus transfer from Hamburg to Cuxhaven. 18.00 - 19.00 Introduction to safety procedures, daily schedule and ship rules. 21.00 - 23.00 Meeting with the instructors. Introduction to educational program. 08.30 - 09.30 Ship evacuation training. 09.30 - 10.00 Meeting with the deck crew and boatswains. Trainees' assignment to the masts and working stations. 10.00 - 11.00 Principles of trimming the square sails. 11.00 - 11.30 Main ropes to trim the square sails. 13.00 - 15.30 Introduction to STS Kruzenshtern sail plan. 16.00 - 16.30 Safety instructions for working aloft. 16.30 - 18.00 First practice aloft. Topmast. 18.00 - 19.30 Introduction to navigation tools. 21.00 - 23.00 Educational movie "Pamir". 08.30 - 10.00 Laying aloft. Cross-tree. 10.00 - 11.00 Introduction to yachting. Main terms. System of yachtsman qualification. Lesson 1. 13.00 - 15.00 Tours to engine room, sailing workshop, radio room. Part 1. 16.00 - 18.00 Tours to engine room, sailing workshop, radio room. Part 2. 18.00 - 19.30 Ship's organization. Lecture. 20.30 - 22.30 Educational movie. 08.30 - 10.00 Laying aloft the yards. 13.00 - 14.00 Hydrometeorology. Local and global winds systems. Weather changing signs. Weather forecast. Beaufort scale. Cyclones and Anticyclones. Lecture. 14.00 - 15.30 Maritime knots . Practice. 16.00 - 18.00 Ship works. 18.00 - 19.30 Navigation. Charts. Electronic devices. Lecture. 21.00 - 23.00 Educational movie. 08.30 - 10.00 Laying aloft. Bending a sail. Test. 10.00 - 11.00 Pilotage. Lecture. 13.00 - 15.00 Laying aloft. Royal yard. The head of the mast. 16.30 - 18.00 Ship works. 18.00 - 19.30 Meeting with the captain. Wrap-up. 21.00 - 23.00 Meeting with the instructors. Wrap-up. Please fill in the booking form and we will get in touch with you as soon as we can. You can wear any kind of clothes you are used to. We recommend to take thermal underwear, warm clothes, windproof jacket and warm hat. As opposed to yachts, it is good to have a pair of shoes with a small heel – it is required while going up the mast, as the heel will bump against the lines. You might also need sunglasses. You do not need yacht gloves — it is not allowed to wear them during works. You may only use gloves with open fingers. To go up the mast, according to safety rules one must cover the head. So take a plain sport hat – you will need it definitely. It is more convenient to take a soft duffel bag. Towels and bed linens are provided onboard. A special maritime insurance is provided to every trainee. We do ask you to be on time for the embarkation. There are about 200 people in the crew list, the departure time is agreed with the port authorities , so there is no possibility to wait for anyone. If a trainee does not arrive to the port on time, he/she will be dismissed. No refunds in this case. All people can get seasick, but severity may vary. 95 percent will get used to ship motions in five hours. If you don't, there is well-equipped medical bay onboard, where you can receive treatment.